Originally, owners clipped their spaniel's tail to increase his mobility in vegetation. Cocker spaniels are descendants of an ancient European dog breed that has been around at least 600 years. While the sad-eyed, floppy-eared breed has distinguished itself over the centuries, it has also accumulated a significant number of hereditary weaknesses and health problems, including vulnerability to various skin conditions. You may be a little confused if your dog has patches of dry and oily skin at the same time. While these two conditions seem to be opposites, they are both the result of seborrhea. Seborrhea causes an overproduction of skin cells that manifests as dry skin, oily skin or a combination of both. 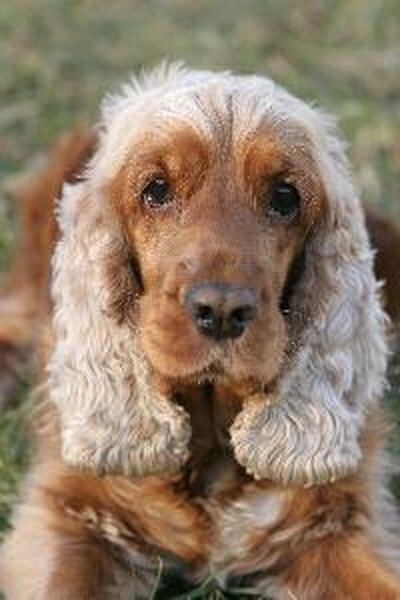 This disorder is common among cocker spaniels and is usually associated with other health problems, including glandular disorders and digestive dysfunction, according to Illinois Cocker Rescue. Standard treatments include administration of vitamin derivatives and regular baths with shampoos and moisturizers specifically designed to combat seborrhea. It is important to have the underlying cause diagnosed and treated by a vet to prevent the problem from haunting your pet in the future. Spaniels are known to develop food allergies, which cause a number of symptoms on their skin. Itchy feet and ears are common in spaniels suffering from dietary allergens, and the skin in these areas often becomes swollen, according to My Cocker Spaniel. Ask your vet about an allergy-free diet for your dog so you can pinpoint the ingredient causing the problem. Don't give your pup any table food while he is on the special diet. Common sources of canine food allergies include chicken, eggs, wheat and soy. Cocker spaniels are one of several breeds that have a hereditary predisposition to a dysfunction of the thyroid gland. Dogs with hypothyroidism don't produce enough hormones to regulate their metabolism, so they often develop chronic skin problems, among other symptoms. Increased dandruff production, constant shedding and scratching are indicators of this disorder. If your dog has been eating less and gaining weight, there is a good chance hormonal imbalances are to blame. While hypothyroidism is a little scary for the owner, it is actually a common problem and can be managed with regular oral supplements. The cocker spaniel's large, floppy ears can actually be a health hazard if they aren't cleaned several times a week. The moist underside of their ears becomes dirty and infected easily. Bacteria, fungi and parasites can cause external ear infections, called otitis externa, that can spread to surrounding skin. Symptoms are similar to those of general skin irritation, like itchiness and inflammation, although ear infections are often accompanied by fluid discharge and an unpleasant smell. Ask your vet about cleaning solutions that are appropriate for your dog. Don't use any cleaning products meant for humans without clearing it with the vet first. Since cocker spaniels are vulnerable to many different skin problems, it is not uncommon for multiple diseases and disorders to compound with each other. As your dog's skin becomes damaged and his immune system weakens, new pathogens and problems can crop up and make things worse. Ringworm, yeast and various bacteria are very opportunistic and will infect your dog's skin whenever they get the chance. Take your dog to the vet as soon as you notice a problem with his skin, even if it seems minor. Check his fur several times a month for parasites, particular fleas and mites. Can Cocker Spaniels Be Depressed? What Does Shaking in Cocker Spaniels Mean? What Is a Field Coat on a Cocker Spaniel?